If I recall correctly, I first read Rammer Jammer Yellow Hammer 11 years ago, after finishing grad school but before starting my full time position - my first foray into reading for pleasure again. The lack of social media evidence corroborates this claim. I'm far more sophisticated as a sports fan, tailgating fan, and RV enthusiast these days. 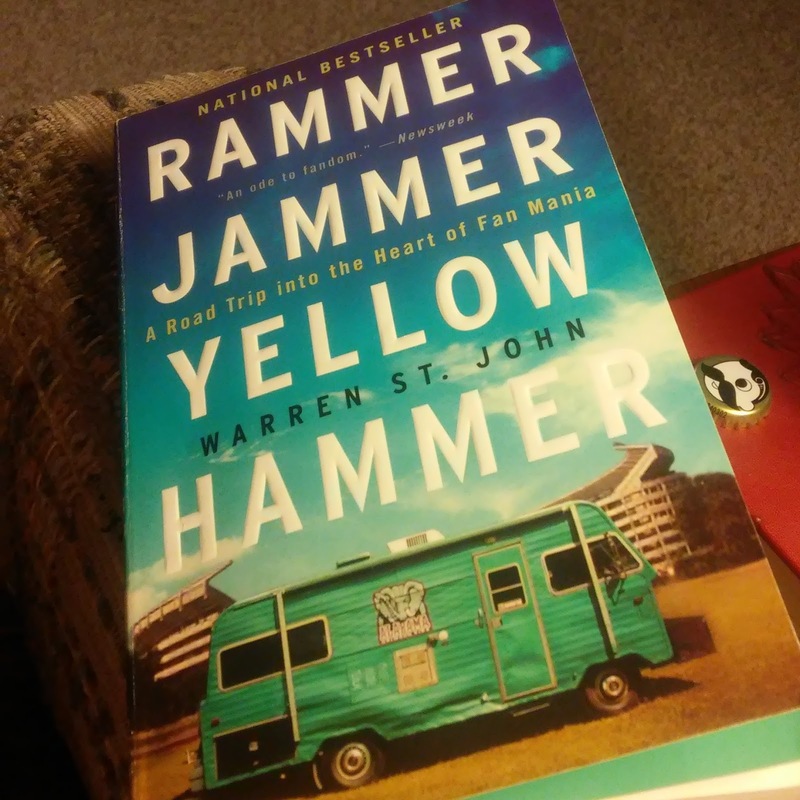 As the full title outlines, Rammer Jammer Yellow Hammer: A Road Trip into the Heart of Fan Mania captures all of the madness that is University of Alabama football. Alabama native and lifelong Bama fan-turned Columbia man and New Yorker Warren St. John follows - nay, joins - the RV corps that supports the Crimson Tide at each football game. The book takes you into the lot with a colorful cast of Crimson clad fans, as well as games - home, away, and Birmingham - booster meetings, ticket brokerages, and a studio set or two. Eleven years ago, it was where I first heard of the eponymous cheer, met PAAWWWLL Finebaum, and in many ways got engrossed in a fan culture outside of my own USF Bulls, then not even a decade old. For St. John, the journey met both the journalistic need of the book itself, but also scratched an itch as a lifelong Bama fan. For me, it was the first book in a series of welcome tailgate escapes for me: To follow would be Clay Travis' Dixieland Delight, Adam Goldstein's Tailgate to Heaven, and the YouTube series Tailgate32, among others. In fact, in the larger sense, it sparked in me other literary escapism in the form of the road trip, as Tar Heel Traveler, America Unchained, and American Pie are also among reads since that time. But now, over a decade later, I read the book with fresh eyes. No longer a mere enthusiast, I follow college football with a fervor that extends beyond just my program. Tailgating too is a passion, and I've got gear befitting of someone who gets into as often as I'd like to, which is to say far more often than I actually do. And perhaps the most recent edition to the many boxes this book checks for me, Serendipity led me to the RV Family Travel Atlas podcast, which I've been listening to for months now, adding yet another layer of familiarity to St. John's quest. Ever since the first read, I've had distant dreams of a similar trek. Revisiting it has reinvigorated the desire. I'd recommend the book to everyone, but be forewarned: It may be contagious.